1. Preheat oven to 375 F (190C). Spray using non-stick cooking spray, 10 preferably non-stick, muffin tin cups. In a medium bowl, stir flour with salt. Using your finger tips or pastry cutter, mix in Becel just until large crumbs begin to form. Whisk water with vinegar. While stirring flour mixture with a fork, gradually add just enough water mixture for dough to come together. Gather into a ball and place on a large piece of plastic wrap. Fold plastic wrap overtop, then use plastic to flatten dough into a disc. Seal with plastic wrap and refrigerate at least 30 minutes. 2. Meanwhile, whisk corn syrup with brown sugar, egg, vanilla, Becel, vanilla and vinegar. Roll out dough about ¼-inch (0.5 cm) thick. Then cut out 10 (4 to 4 1/2-inch/10 to 11-cm) circles, using a lightly flour glass or circle cutter. Press circles into muffin cups. Divide raisins among tart shells. Then fill with corn syrup mixture. 3. Bake until a deep golden, 22 to 25 minutes. Let stand a couple of minutes. Then remove to a rack to cool. Notes: I didn't make my own pastry for this one, I was in a rush and bought premade tart shells. 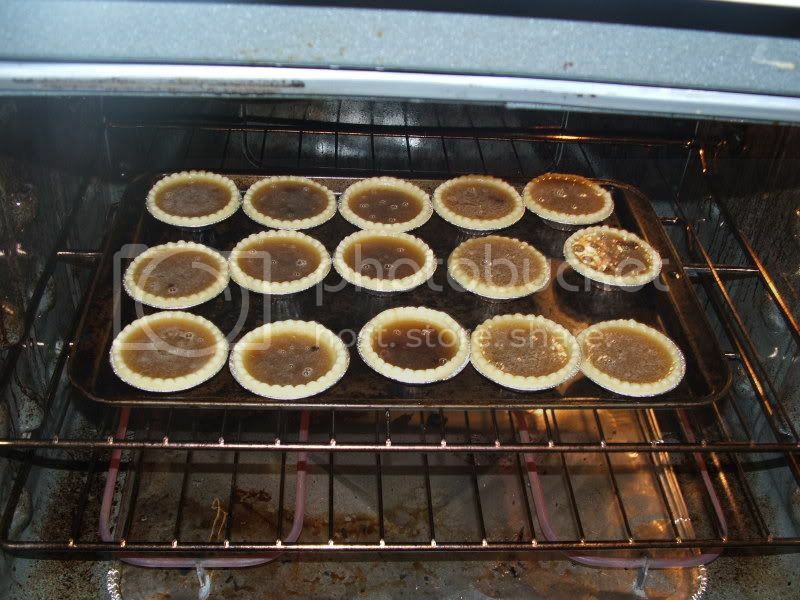 The tart shells were small so this make about 16 tarts with the filling. They turned out great, I wasn't sure and I did try one or two which is a no-no since I'm still watching my blood sugars but they were yummy.